Client's Request: Thank you for calling the UC Master Gardener Program Help Desk this morning with a question about your young peach tree. You have a young tree, planted bare root into a pot in January 2018, and then transplanted directly into the garden in the late spring / early summer when you were able to do so. You planted several fruit trees at the same time, and all were planted initially into pots and then into the garden, in roughly similar locations, with good drainage in the garden. All of the trees have been similarly irrigated. All of the trees are doing well with the exception of the peach. The peach had curling leaves last year (every single leaf appeared wilted) and you would like to prevent this, this year. You are wondering whether this is “peach leaf curl” or something else, and whether or not to presume it was peach leaf curl and to spray now. If, after looking at these images, you decide that your leaves looked like this, then I would proceed as recommended in the UC Pest Note linked above. If you do not think that your leaves looked like this, then we need to consider other possibilities. 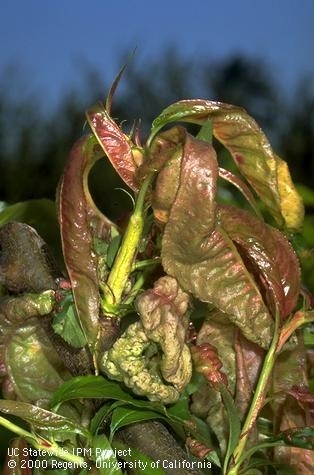 Wilted leaves can be evidence of a water transport problem in the plant. In this case, something in the vascular system isn't working as it should. Beginning with the transplant from pot to garden last year, is it possible that the root ball was damaged? 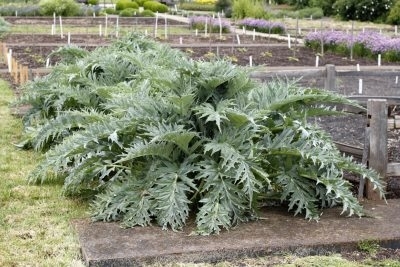 Or that there were air pockets in the garden created during transplant, causing some of the roots to dry out? Or that moles, squirrels or other garden visitors have created air pockets near the roots? If you think this is possible then I would dig down and fill those pockets with a wet-soil-sludge mixture to fill them in. Young trees have undeveloped root systems that are not very extensive. Because of this, your young trees need consistent moisture levels in their root zone in order to thrive. The "goldilocks" amount: not too much, not too little. Some peaches are susceptible to root-feeding nematodes. Nematodes are tiny, eel-like roundworms. 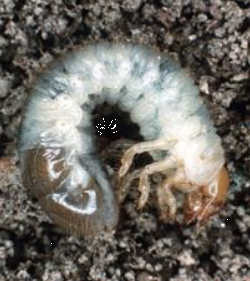 The species that attack plants are usually too small to be seen without a microscope, a soil test will be required. Here is a link to our local ist of soil testing labs for home gardeners. (http://ccmg.ucanr.edu/files/51308.pdf) Different labs perform different tests at different costs. I suggest that you call all or some of the labs to find out if they test for root feeding nematodes, whether or not the tests can provide definitive results, and the costs. The soil test can also provide information about the nutrition available in your garden soil, if you request this. You mentioned that you purchased the tree from a local nursery. Although a few local nurseries (usually bigger stand-alone ones) also are a grower for some species, they do not grow their own fruit trees, they rather purchase them (this year, last year, and many years prior) from a grower specializing in fruit trees, often in the Central Valley or lately for citrus in the Monterey Bay area. You might take a look at one of the various grower nursery websites and look up the particular variety of peach that you purchased to find out what you can learn. Most of the nursery grown fruit trees are grafted on root stocks. Some rootstocks are resistant to root-feeding nematodes. It might be helpful to know whether you have a more susceptible tree by identifying the rootstock which can often be found in the grower's catalogue or web site..
Good luck with sorting this out and please contact us if we can help further. Client's Request via email (preceded by telephone conversation at 925- 608-6683). Thanks for your interest in our distressed navel orange tree. Here is the information you requested from our phone conversation and some photos. My 60 - 80 (?) 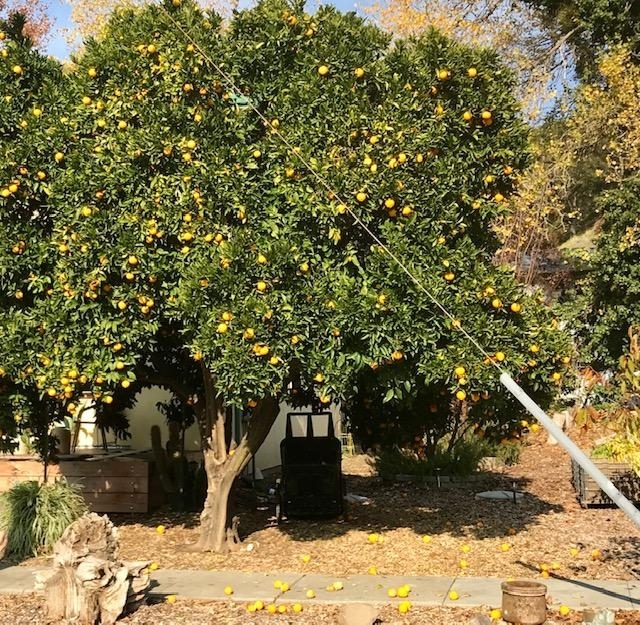 year old orange tree has, for the three years we have lived here, regularly produced abundant crops of many hundreds of exceptionally delicious fruit each year, February - June. 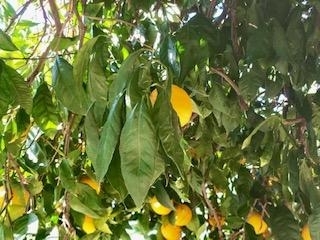 In the last four weeks it has been dropping oranges at an increasing rate, by now many dozens a day, totaling over 300. It is over two stories tall and grows in Martinez, California, in a moderate climate with hot summers and cool winters. As you can see from the photos, the fruit is splitting, leaves are drooping, the canopy is diminishing, and a few clusters of branches have died. There is a tree nearby of the same age and size that does not appear to have any problem at all. Our tree has not been watered regularly during the dry season, whereas the neighboring tree is surrounded by a watered lawn. It was given a fertilization of nitrogen last year, and we wonder if this, or the lack of watering, could be the cause. What can we do to save this magnificent tree? Splitting citrus fruit is a common problem, especially with navel oranges. 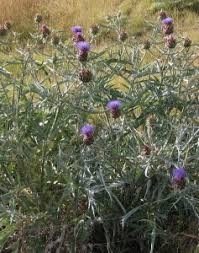 The following link (http://anrcatalog.ucanr.edu/pdf/8038.pdf) is a short 1-1/2 page informative UC document which describes the condition, along with suggestions for resolution. 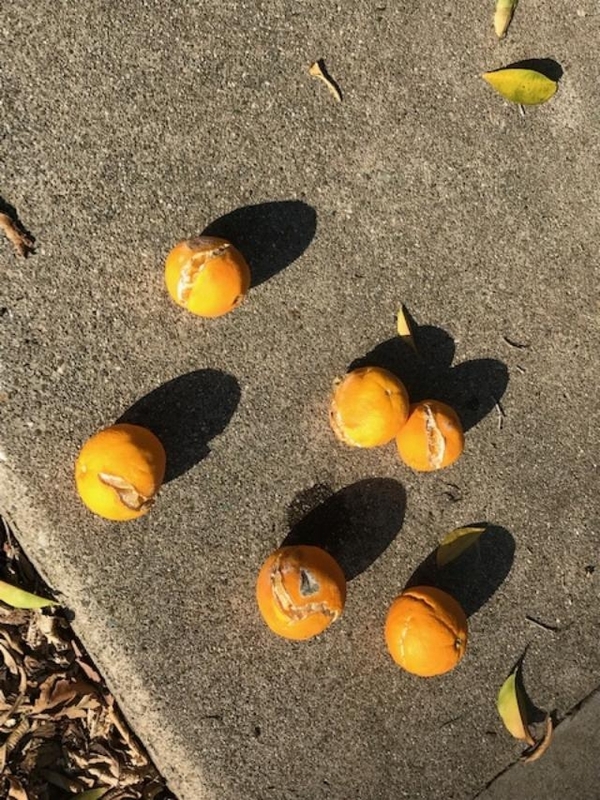 Very briefly, fruit splitting is likely the result of stress to the tree, and is probably related to extreme fluctuations in temperature, humidity, soil moisture, and possibly fertilizer levels. The disorder is often caused by a combination of these factors rather than by a single cause. 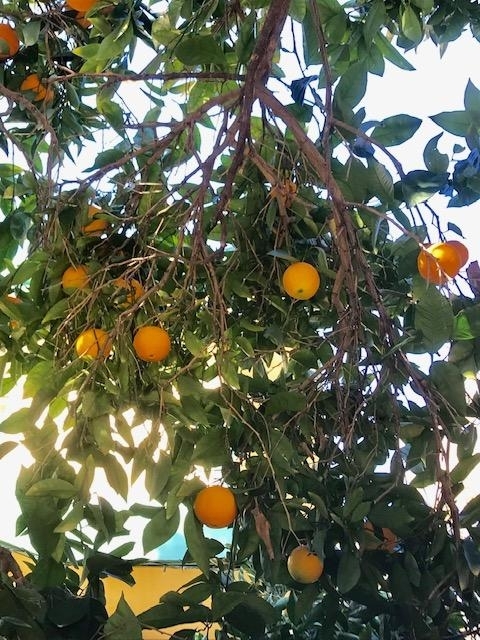 Avoiding fluctuations in soil moisture (I suggest adding mulch under the tree canopy and consistent and ample water, especially during heat spells) as well as fertilizer levels throughout the growing season may help to minimize fruit split. I believe the leaf drooping and turning over are also symptoms of too little water during the hot season. The dropping of leaves and resulting thinning of canopy often are the result of too little water on both fruit and ornamental trees. I am also including some additional links which will provide information on growing healthy citrus here in Contra Costa County. 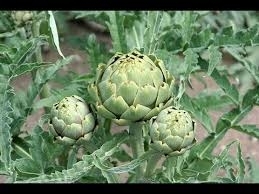 In particular take a look at the 2nd link below as that will provide you with assistance on watering and fertilizing.